This book was absolutely slaptastic. As in I wanted to slap so many people, so hard, my hand hurt! Mr. and Mrs. Wakefield are not happy with each other anymore. Mrs. Wakefield got stupid, while also working a real job fulltime and Mr. Wakefield’s inner jackass has taken a semi-permanent residence. Mr. Wakefield moves out at the beginning of the book and into a one bedroom apartment downtown. Because it is an apartment and not a house, and it is empty since he hasn’t unpacked, Elizabeth thinks it is the most depressing place in the world and wants to cry. You better get used to it because Elizabeth wants to cry every other page in this book. Elizabeth thinks that her parents’ breakup is all her fault, because she gave her mother’s assistant the phone number to the cabin her family vacationed at for a weekend. I mean her dad did freak out when her mother got the call from work, and when her mother left their family weekend early he gave her an ultimatum and she chose work instead of their family… But they had been fighting like crazy for a few books, before Elizabeth got stupid (or I guess do something stupid is more accurate) so really she’s just making it all about her. Jessica is still hung up on Charlie, the guy she has been talking to off the teen party line. Oh and about that – Jessica was finally caught and the bill was hundreds of dollars just for her phone calls. Her mother grounds her and says her allowance is suspended until her debt is repaid and Jessica thinks this is cruel and unusual, when it sounds pretty fair to me. But don’t worry about Jess, she was born to have her parents separate, because she keeps playing them off one another. She goes to her father for money and gets him to talk to her mother, which only creates more problems between her parents, but that isn’t Jessica’s problem, so whatever. Back to the thing about Charlie… Lila Fowler and Amy Sutton keep hounding Jessica about how she hasn’t met Charlie in person yet, so Jessica tells him she is going skating with him Saturday. She decides she’ll make it clear to him that he either meets her on Saturday or he can forget about her forever. He goes with Saturday, but something isn’t right. It seems too easy, and I already know Charlie is less studly than she thinks he is. That’s why he’s been so gun-shy. When they meet on Saturday, it turns out Charlie is gorgeous, but he is also an airhead, who lacks a sense of humor or any other personality trait. It’s clear he’s not the real Charlie, but Jessica can’t seem to understand this. She just wonders why he’s so different. She gives the guy another try, but then decides he’s a dud so that’s done. Elizabeth can’t seem to do anything right. She disappoints on an English paper and is starting to slack at her job on The Oracle, the high school newspaper. She is super depressed and blows Todd off a couple of times by accident. The more distant she becomes the clingier he gets. I understand this, but he doesn’t seem to understand he shouldn’t smother her after her parents split, especially when his parents are happily married. But he’s always been a dumbass that way. Finally, he tells Elizabeth that it sounds like she doesn’t want to be around him anymore, and she agrees! Yes! But of course, it’s not legit, and more about how jaded she has suddenly become… God, I want to scream. But it gets even better… Steven keeps coming home and he and Jessica keep fighting, and Elizabeth keeps trying to get them to stop fighting, which only gets both of them angry and screaming at Liz. Sigh. Are you slap-happy yet? One afternoon Jessica and Steven are fighting, as usual, and then turn on Elizabeth when she tries to play peace keeper. Jessica tells Liz that their parent’s separation is all her fault because she gave out their number in Tahoe, and Steven actually agrees. God, I want to slap all three of them, right now. Knock ‘em down like dominoes. Liz is completely distraught and decides to run away. But first she tells Enid, and I’m like, “Why?” I’d just be gone, but I guess that’s just me. Enid convinces Elizabeth to stay over at her house instead of leaving town (Liz was going to go to Michigan where her grandparents are or to see her aunt in Texas). Elizabeth agrees, but only if Enid won’t tell Elizabeth’s family where she is. She just wants the night to herself and is afraid they would make her come home. But she does write both of her parents a note that says she is staying with “a friend” along with how she knows it’s all her fault – blah blah. Enid drops them off for her. Mr. and Mrs. Wakefield both freak out when they get Liz’s letters and I thought, “Aw, they care,” even if they’re totally whack. They call all of her friends but no one knows where Liz is, and Enid’s line is busy all night. I don’t understand why they don’t just go over there. I mean, where else would she be? The next morning they do, and Elizabeth comes back and finally realizes that she can’t take the blame for everything in the world and she should stick to things that are actually her problem – like choosing Todd Wilkins over Jeffrey French! Mr. and Mrs. Wakefield are still separated but seem to be in a slightly better place after Elizabeth’s night away. Jessica and Steven are getting along too… Maybe Elizabeth is the problem! 😛 Jessica tries to make up for what she said to Elizabeth by playing matchmaker. She calls Todd, posing as her sister and asks him to Secca Lake to talk. Then she dresses as Elizabeth and meets him and apologizes and tells him how she was wrong and loves him. But before he can kiss her, she says she has to go back to her car to get something. Steven, who was in on it, is waiting with Elizabeth who overheard everything. She’s so happy Todd still wants her, and takes Jessica’s place, with Todd none the wiser. Anyone else think this is seriously fucked? There is a costume party/dance at school (finally, there hasn’t been one in ages 😉 ) and Jessica gets the real Charlie to come as Amy Sutton’s date and the fake Charlie to come as hers. This way she can scope the real Charlie out, and just how ugly he is. She predicts that both boys will be fighting for her attention, except that they both end up fighting for Amy’s. This just makes me realize how whack both of these guys are too. Talk about a lack of taste! 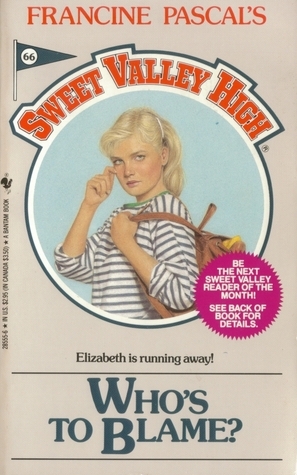 This entry was posted in Book Reviews, Books, fiction, Guilty Pleasures, Reviews and tagged "in the middle", "mistaken identity", "sweet valley high", "trial separation", blame, book, break up, family, guilty pleasure, matchmaker, parents, review, sweet valley. Bookmark the permalink.